This portion is named: ‘Kedoshim’ (holy ones) after the verse: “Be holy because I, HaShem, am Holy”. This is called the “love” parasha, and Hillel the sage and one of the greatest students of his house – Rabbi Akiva – taught that it contains the Heart of the Torah. The portion is all about Love. Love towards God and Love towards other human beings. I’d encourage everyone to read this portion at least ten thousand times. From Leviticus 19:2 to 19:18, what we are reading is a periphrasis on the Decalogue. Just compare them and notice it’s all included in there (cf. Vayikra Rabbah). Respect to the parents, charity, unity… it’s all there! Every single verse contains lots of Divine information. From this we learn that if one sees his fellow drowning in a river, being dragged off by a wild animal or attacked by robbers, that one is obligated to save him (Sanhedrin 73a). What do we learn? Why are these two commands together? It’s because of the putrid nature of gossiping, which is similar to that of murder. Gossip kills integrity, kills relationships, kills respect, brings hatred and kills spiritually (cf. Tosefta, Drekh Eretz 6:3). The Psalmist compares the deceitful tongue to “Sharp arrows of the warrior, coals of broom” (Psalm 120:4) – weapons that kill from the distance and remain in the heart like the coals of broom. “Evil speech kills three people: the speaker, the listener, and the one who is spoken of” (Erakhin 15a). “Love your neighbor as yourself” (Lv 19:18). This is the greatest principle of the Torah” (sifra, kedoshim 4:12). “What is hateful to you, do not to your fellow man. This is the entire Torah; the rest is the commentary; go and study it” (Shabbat 31a). As physical beings, one’s self and one’s fellow are indeed two distinct entities. As spiritual beings, however, they are ultimately one, for all souls are of a single essence, united in their source in God (cf. Rabbi Schneur Zalman). “Love your neighbour as yourself” contains the secret of empathy. How difficult is for human beings to put themselves in the place of another person, especially if they don’t know the other person, or worse, if the other person made something they don’t like. Our sages taught: “Do not judge your fellow until you have stood in his place” (Pirkei Avot 2:4). “The stranger that sojourns [(as a guest)] with you must be to you as the home-born among you. Love him as yourself; for you were strangers in the land of Egypt: I am HaShem your God” (Lv 19:34). In a hallakhical interpretation this speaks of “converts”, however, the literal meaning does not speak of converts, but of “foreigners”; “outsiders”, non-converts. It is written that “This is the book of Adam descendants (Gn 5:1); this is a great principle. … you must not say: since I’ve been put to shame, let my neighbour be put to shame… If you do, know whom you put to shame, [for] in the likeness of God he [Adam] was made [and we all are his descendants]” (Bereshit Rabbah 24:7). The Torah even goes further and teaches that “loving others as ourselves” includes helping our very enemy in case he needs help (cf. Ex 23:4-5), and not to revenge by ourselves. “if your enemy is hungry, give him bread” (Prov 25:21). Loving our neighbour and even loving our enemy however, doesn’t mean we are to love their sinful practices. Our portion ends with a list of sinful behaviour of the Caninites which we are forbidden to emulate. This is the principle of “Be holy” because I, God, am Holy. Holy means to set yourself apart to God; to be of different behaviour and different heart. So great is the mystery hidden in the three letters that compose the Hebrew verb for “Love” – Alef, Hei and Beit – אהב. 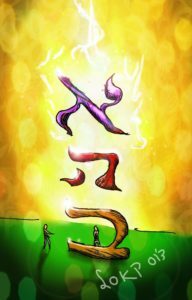 Alef stands for ‘One’ (=1), and for ‘Alufo [shel Olam]’ (the Ruler of the universe); the first time Alef appears in Torah, it’s the first letter of the word “Elokim” (God); and is used as the first letter of many of God’s names such as El, Adonai or Ekyeh. It’s also the particle ‘Ani’ (I, me). Hei stands for bestowing and receiving, as in the verse: “take [hei] for yourselves seed” (Gn 47:23). The form of the Hei is like a window in the heart opened for tolerance (cf. Tomer Devorah 1:7). It also stands for “existence” (haya – היה). Beit is a house (Bait), “The mystical House” which is Creation – Beriah (which starts with letter Beit – בריה). And man is a microcosmic Beit haMikdash (a little Sanctuary – ביתהמקדש). The connection Alef-Beit represents the connection between Father (Avאב ) and son (Ben – בן). “Love your neighbour as yourself” (Lv 19:18, 34). Because the Gematria of the noun “Love” (Ahava) equals ‘One’ (Ekhad). This is also a secret hidden in the verse: “Israel, HaShem Elokeinu, HaShem Ekhad” (Israel, HaShem our God, HaShem are one) and it follows: ‘And Love HaShem your God with all of your heart”. Because Israel is One with God on account of Love. 13 in western world is associated with “bad luck”. But as we have seen, in Kabbalah 13 is the number of Love. By no coincidence 13 is the 7th prime number (considering that Alef always stands for the number 1). 13 is also the connection between Zeir Anpin and Nukva. Zeir Anpin (The letter Vav in God’s name) also called “the Groom” equals 6, and Nukva (the Seventh emotive Sefirah) also called “the Bride” equals 7. 13, mystery and beauty of unity. That’s why the tribes had to be 12, because with God they become 13 (= Ekhad, one = ahavah, Love).